Show fully stylable slide-in and pop-up surveys in your website, at the right moment, to the right users. Choose from many advanced triggers and targeting options, like exit intent, page scroll, idle time, button click, and more. 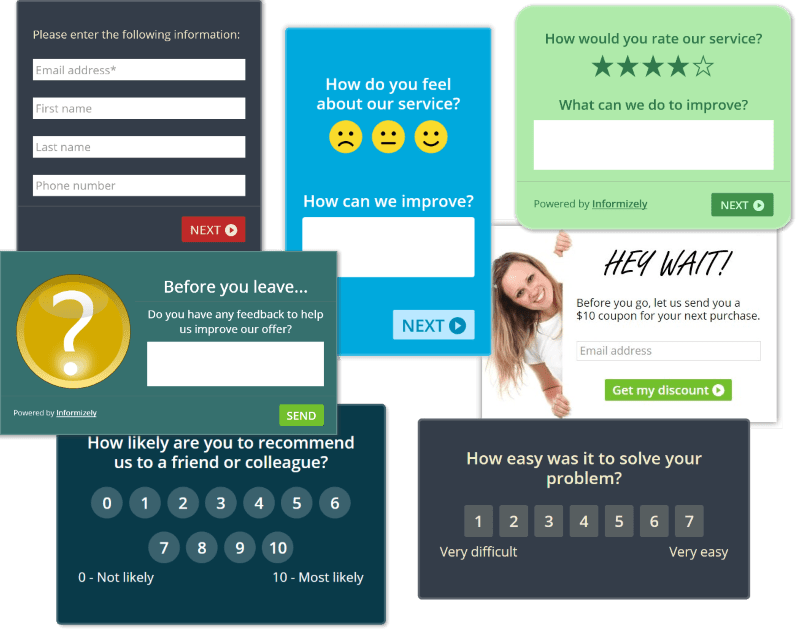 Net Promoter Score, smiley scale, star and number scores, single and multiple choices, and text answers. Reporting API, Widget control API and Webhooks. Works in all websites, including WordPress, Joomla, Drupal, Squarespace, Magento, and all other CMSs. I highly recommend Informizely for the serious optimisation specialist. 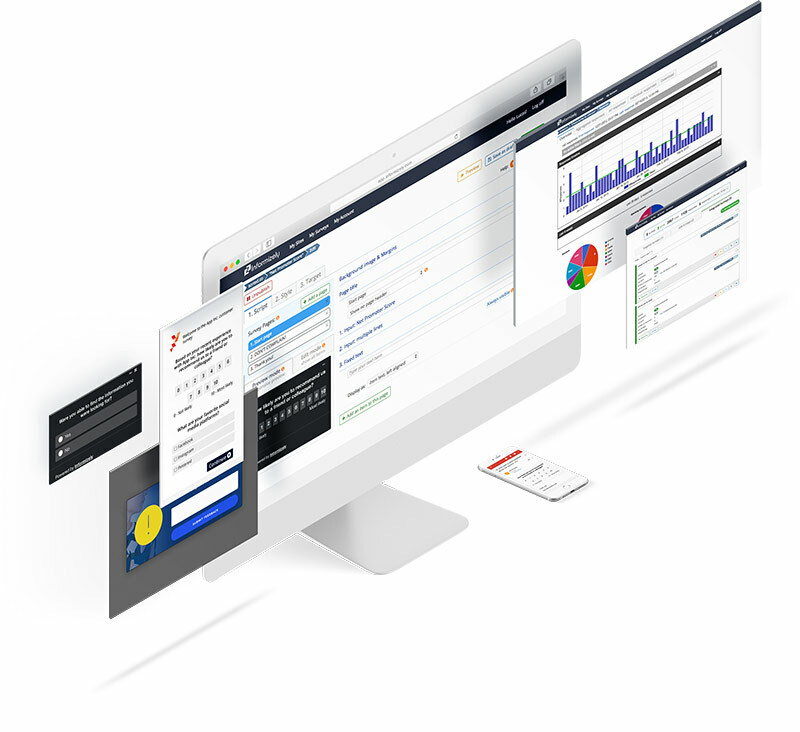 Of all tools out there, Informizely offers the best combination of functionality, price and excellent support. Positive from the first time you use it. Very easy to use and all targeting and customization options that we need are available. I've used this tool for 5 different companies now and haven't encountered any limitations yet. Highly recommended! Show beautiful slide-in and pop-up surveys and promotions in your website at the right time. Embed NPS, CES, rating and choice questions directly in emails. Get deep insights using full page questionnaires, distributed by a public link. Embed survey questions in an HTML app. E.g. in a chat message, or in your own web page. Show a survey or promotion at the moment a visitor is about to leave your site. Use Informizely exit pop-ups to reduce site abandonment and increase conversions. "How likely are you to recommend us to a friend or colleague?" 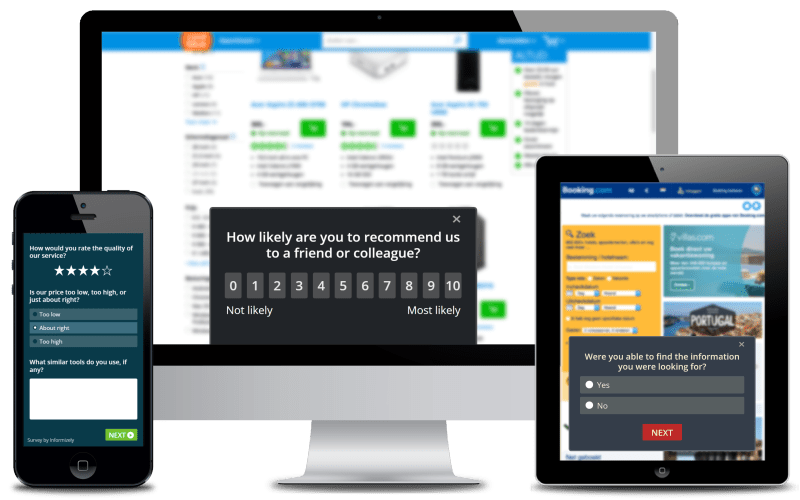 Use Informizely to show an NPS survey at the right time and track your NPS score through time. Show surveys in a device-optimized manner on mobile devices. Add custom metadata to survey responses. Optionally use this data for targeting your surveys.